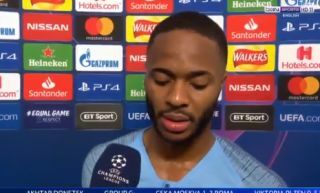 Manchester City star Raheem Sterling has spoken about the bizarre incident that led to him being awarded a penalty against Shakhtar Donetsk on Wednesday night. The England international appeared to just trip over in the box before the referee blew his whistle and gave City a spot-kick in an emphatic 6-0 win. Sterling has apologised for the incident, insisting he did not mean to con the referee and that it was just a misunderstanding.